For our may cruise this year we had planned going to York via the Rivers Aire and Ouse along with the connecting canals, however the weeks before the planned trip were filled with persistent rain and after a conversation with the Selby lock keeper (over a meter of flood water and more rain forcast) it was decided not to risk it. From Clarence dock the only "river" free route is via the Leeds and Liverpool, except for the short section of the Aire through Leeds from Clarence dock to River lock and the start of the L&L. On the Saturday the Dock gates are open all day, but closed Sunday and on Monday morning as we prepared to depart they remained resolutly shut. A call to BW and eventually the gates were finaly opened at around 11:00. Another single handed boat departed just ahead of us from the visitors mooring, and we followed it up to River Lock with a locking crew walking along the bank. We worked through the lock together, the first of many as we ended up working all the way to Skipton. After a full day we moored up between Rodley and Apperley Bridge and had dinner aboard. Tuesday we set off mid morning alone, the single handed boat having set off on its own earlier in the day. We had a fairly easy day climbing up the 2 rise Dobson and 3 rise Field locks before mooring up in Saltaire mid afternoon. Bluebell the Single handed boat was also moored in Shipley and came to join us in the woods above Saltaire, although he had managed the locks without problem the many swing bridges had proved to be a struggle, and he was looking for a boat to pair up with. Tuesday evening dinner in the "Dont't tell Titus" restauant, a refence to the temperence views of Saltaires founder Titus Salt. 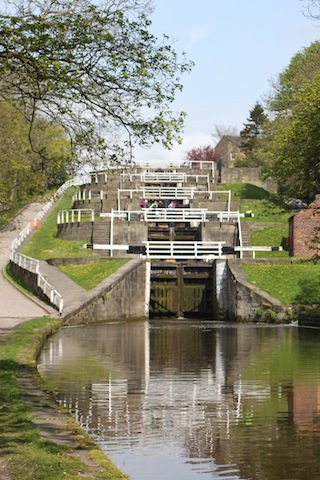 Wednesday we set of just after 9 AM and along with Bluebell made our way through Hirst and Dowley Gap locks before tackling the 3 and 5 rise locks at Bingley arriving at the top of the Bingley 5 rise at around 12:30. The afternoon we spent travelling the long level pound to Skipton arriving around 6PM. Along the way we met up with Horse Boat Elland also making its way to Skipton for the Water festival over the weekend of 5th/6th May. Unfortunatly while we were talking to Sue the "owner" of Elland our Jack Russel and a Scotty dog belonging to one of Ellands crew were having a set too and while retrieving our dog got bitten on the leg by the other dog. We decided to leave Elland and head off ahead of them. Wednesday night in Skipton at the Narrowboat inn for quiz nght and some excellent pub food and perfectly kept ales. Thursday morning a late start leaving time to explore Skipton after turning at the entrance to the Springs branch and talking water before heading back through the Bingley flights and Silsden to an overnight mooring in Riddlesden. Dinner on the boat and a few pints in the Marquis of Granby for another Quiz night where we were joined by Sue from Horse boat Elland. Friday another late start and an Afternoons cruising brough us back to Saltaire, for a change we visited the Boathouse for dinner, not as good as the Don't tell Titus but a pleasant night none the less. Saturday a late start to give time to explore Salts mill before setting off to to Rodley, mooring just below the swing bridge. Dinner in the Jaipour in Armley by taxi, as allways an excellent evening with great food, reccomended. Sunday we set off in company with another boat for the trip back to Leeds. Several of the locks particularly the staircases leaked badly and with the 60ft boat often flooded over the rear deck, even with the rear doors closed the water was floodig in and rnnning down over the engine, causing at least one hear stopping moment when the engine coughed and spluttered and produced copious quantities of smoke, later investigation showed water had been getting sucked in to the air intake and was blocking the air filter which was removed to dry. we eventually arrived back in Clarence dock around 1PM. Another enjoyable trip, next planned trip the Tidal Trent and Fosdyke to Lincon. As you will probably of heard the continuing dry weather is already causing problems on some of the Canal network, and already we have planned closures in the pipeline with the GU Leicester Line and several of the GU branches being closed completely from 13th April. Many other restrictions are already in place or planned. This may well restrict our possible routes over the summer and may need changes at short notice. I am in the process of transferring and updating the Site content on to the new web site, some content may not have been transferred yet, to view the old web site use the link below.